VANCOUVER, BRITISH COLUMBIA--(Marketwire - Aug. 27, 2009) - Northern Freegold Resources Ltd. (TSX VENTURE:NFR) has added 152 new claims to its 158 claim Tad/Toro property in the Dawson Range, based upon encouraging results from NFR's Freegold Mountain Project and the intense interest in properties in the Dawson Range and White Gold District by Underworld Resources and other companies. The Tad/Toro Property is located 25 km to the northwest of Northern Freegold's 166 sq. km Freegold Mountain Project where an initial inferred 1.08 million ounce gold resource (67.57 million tonnes @ 0.50 g/t gold with 0.30 g/t gold cutoff) was recently announced (see news release dated July 27, 2009). The new claims will almost double the size of the Tad/Toro Property, bringing it up to approximately 32 square kilometers. 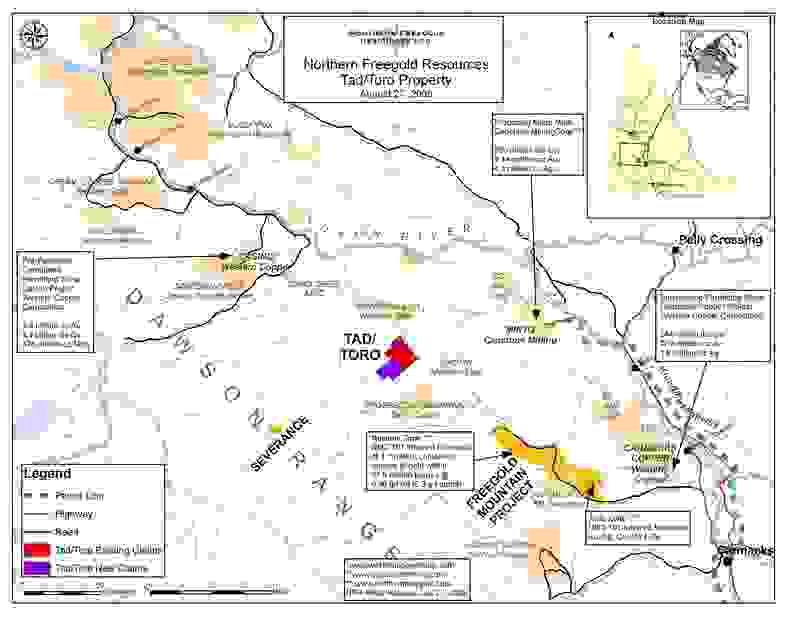 The Tad/Toro Property is located within the 100 km long Big Creek portion of the 250 km long Dawson Range copper-gold belt (see attached map: http://media3.marketwire.com/docs/Tad_toro_August27.jpg). Deposit models within the belt include porphyry copper-gold+/-molybdenum, associated epithermal vein and breccias systems and peripheral polymetallic veins. Historical work on the property including geological mapping, sampling, geophysics, trenching and diamond drilling indicates Tad/Toro has the potential to host gold-copper+/-molybdenum mineralization similar to that of the Casino Deposit (7.9 million ounces gold, 4.3 billion pounds copper and 475 million pounds molybdenum, www.westerncoppercorp.com) to the northwest. Historical drilling carried out in 1969 targeted copper values in a porphyry body. Re-analysis of a portion of this core for gold in 1986 by Noranda Exploration Co. Ltd. returned encouraging gold values in three holes: T-2 gave 0.51 g/t gold over 37.0 m (including 1.0 g/t gold over 8.2 m); T-12 gave 1.23 g/t gold over 4.9 m; and drill hole T-14 gave 1.68 g/t gold over 7.0 m (as reported by Noranda, with no reference as to which lab prepared and assayed these results, or whether the lab was accredited). Sampling of another unsplit interval from T-12 during 2007 due diligence work for the preparation of the NI 43-101 compliant report filed on Sedar, returned significant results of 1.13 g/t gold and 8.7 g/t silver over 7.9 m, including 5.07 g/t gold and 29.5 g/t silver over 0.9 m. Other potential economic minerals exist in substantial amounts in other unexplored zones. Work in the late 1990s at Tad/Toro outlined over 10 drill targets, many of which are focused on gold soil anomalies in conjunction with geophysical anomalies. Access to the property is via an existing tote trail, known as the Casino Trail which is used year round to access active hardrock and placer projects at Sonora Gulch, Prospector Mountain and Hayes Creek (the location of the Tad/Toro Property). Nuggets of tetradamite and other bismuth-gold telluride minerals in placer concentrates have been recovered from placer operations on the Tad/Toro Property. The technical information disclosed in this release has been reviewed and approved by Susan P. Craig, P. Geo. The reserves and resources mentioned in this release have not been verified by the qualified person and the information is not necessarily indicative of the mineralization at Tad/Toro. Northern Freegold is a well financed rapidly advancing Canadian-based precious metals exploration and development company, which brings local expertise and strong management to focus on the development of economic mineral resources on the district-scale Freegold Mountain gold and copper project in the Yukon and the Burro Creek gold and silver property in Arizona. The information in this press release includes certain "forward-looking statements" All statements, other than statements of historical fact, included herein including, without limitation, plans for and intentions with respect to the company's properties, statements regarding intentions with respect to obligations due for various projects, strategic alternatives, quantity of resources or reserves, timing of permitting, construction and production and other milestones, are forward looking statements. Statements concerning Mineral Reserves and Mineral Resources are also forward-looking statements in that they reflect an assessment, based on certain assumptions, of the mineralization that would be encountered and mining results if the project were developed and mined in the manner described. Forward-looking statements involve various risks and uncertainties. There can be no assurance that such statements will prove to be accurate, and actual results and future events could differ materially from those anticipated in such statements. Important factors that could cause actual results to differ materially from NFR's expectations include the uncertainties involving the need for additional financing to explore and develop properties and availability of financing in the debt and capital markets; uncertainties involved in the interpretation of drilling results and geological tests and the estimation of reserves and resources; the need for cooperation of government agencies and First Nation groups in the exploration, and development of properties; and the need to obtain permits and governmental approval. NFR's forward looking statements reflect the beliefs, opinions and projections of management on the date the statements are made. NFR assumes no obligation to update the forward looking statements if management's beliefs, opinions, projections, or other factors should they change. This press release has been prepared in accordance with the requirements of the securities laws in effect in Canada, which differ from the requirements of U.S. securities laws. Unless otherwise indicated, all resource and reserve estimates included in this press release have been prepared in accordance with National Instrument 43-101 Standards of Disclosure for Mineral Projects ("NI 43-101") and the Canadian Institute of Mining and Metallurgy Classification System. NI 43-101 is a rule developed by the Canadian Securities Administrators which establishes standards for all public disclosure an issuer makes of scientific and technical information concerning mineral projects. Canadian standards, including NI 43-101, differ significantly from the requirements of the United States Securities and Exchange Commission ("SEC"), and resource and reserve information contained herein may not be comparable to similar information disclosed by U.S. companies. In particular, and without limiting the generality of the foregoing, the term "resource" does not equate to the term "reserves". Investors should also understand that "inferred mineral resources" have a great amount of uncertainty as to their existence and great uncertainty as to their economic and legal feasibility. It cannot be assumed that all or any part of an "inferred mineral resource" will ever be upgraded to a higher category. The estimation of quantities of resources and reserves is complex, based on significant subjective assumptions and forward-looking information, including assumptions that arise from the evaluation of geological, geophysical, engineering and economic data for a given ore body. This data could change over time as a result of numerous factors, including new information gained from development activities, evolving production history and a reassessment of the viability of production under different economic conditions. Changes in data and/or assumptions could cause reserve estimates to substantially change from period to period. No assurance can be given that the indicated level of mineral will be produced. Actual production could differ from expected production and an adverse change in mineral prices could make a reserve uneconomic to mine. Variations could also occur in actual ore grades and recovery rates from estimates. About this company Northern Freegold Resources Ltd.